Government run healthcare is so intrusive, the Obamacare website is so dysfunctional and enrollment has been so dismal that the Obama Regime has resorted to spending OUR money on many ad campaigns to get people to sign up. One of these tactics has been to encourage people to talk to their friends and family members (especially the young and healthy millennials) at family holiday gatherings. First Lady Michelle has even gotten into the act. This desperate push started on Thanksgiving and has continued right up through Christmas. Unfortunately for the regime the results have mostly yielded coal. Click HERE to see more tweets. You won’t be disappointed. And by the way, if this weren’t so sad it would be halarious! 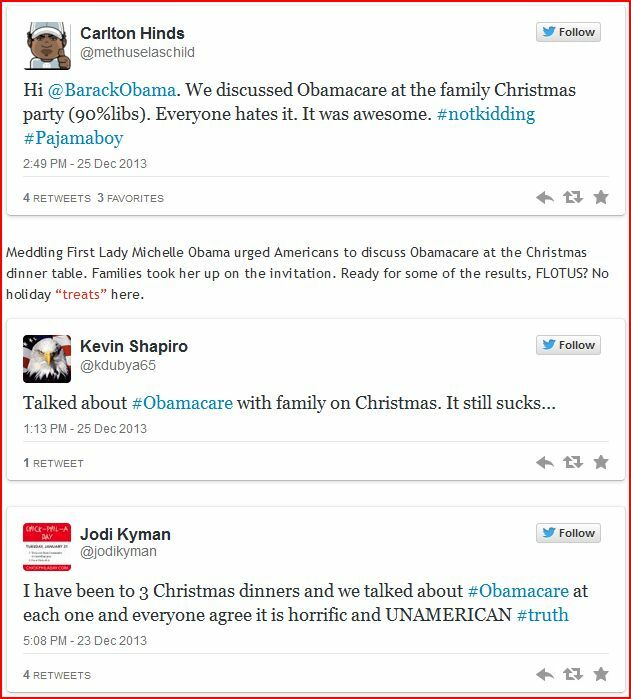 This entry was posted in 2014 Elections, 2016 Elections, Executive Branch, Healthcare, Major News Items, Media, National, Unalienable Rights and tagged discuss obamacare, Families discuss obamacare, Healthcare.gov, Obamacare, Obamacare website, pajama boy. Bookmark the permalink.